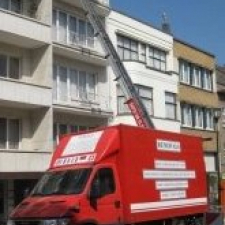 Professional Company, 25 years experience, friendly, no stress, punctual removal and delivery services etc. at very competitive rates. Covering short/long distances within Belgium and throughout Europe. Provides all kinds of delivery services (e.g. Ikea, other furniture shops, washing machines, dryers, fridges, beds etc). Choice of two vans 10m3 or a brand new 25m3 van equipped with hydraulic lift and protection materials for your furniture. Boxes. special boxes for hanging clothes, bubblewrap etc. available upon request. For a quote, do not delay! go ahead and contact Simon today!